No. 269 Leigham Court Road, 1968 -1973, was designed as sheltered housing for older people by Kate Macintosh for the London Borough of Lambeth; it includes 44 flats, a common room, shop, laundry, guest room, and warden's flat and office contained in seven blocks, linked by a covered walkway. The site also has some hard landscaping features, such as low walls, patios and paving, to the front and within it. The Leigham Court Road site was the former garden of a Victorian villa. Deep, with a narrow road frontage, it presented several design challenges. The shape of the site limited the opportunity for residents to overlook the everyday activities of society (it was feared this could lead to a sense of isolation), and situated in a quiet and leafy residential part of Streatham, there were no shops within easy walking distance. Macintosh resolved this by incorporating a shop at the front of the site, and placing the dual-aspect common room beside it. The shop, an unusual inclusion in such a small scheme, serves the residents and the wider community, offering an opportunity for social interaction; the positioning of the common room allows residents to observe the comings and goings of customers and passers-by. 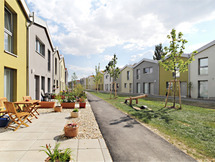 After its completion the scheme won a Department of the Environment Housing Commendation. State-funded, purpose-built housing for older people is a predominantly post-war phenomenon, a feature of the 'cradle to grave' vision for the welfare state. With increasing life expectancy, and the social changes brought about by the Second World War, there was a recognition of the need for new approaches to the housing and care of older people. The charities Help The Aged and Age Concern (now together forming Age UK), were founded in 1961 and 1971 respectively, the latter originating from the government-funded Old People's Welfare Committee formed in 1940. Local authorities were responsible for the provision of suitable housing for the elderly, but the quality and type of accommodation they offered varied widely. Sheltered housing, with its roots in the almshouse tradition, emerged as a model in the 1950s, but space standards were not generous and features such as 'cupboard kitchens', and shared bathroom facilities, underline the modesty of earlier examples. The real turning point for quality and innovation in housing for older people took place from 1969. There was a will amongst the most progressive local authorities to provide a high quality of accommodation for older people, and in 1969 the Parker Morris space standards, which had up until that point been guidance only, became mandatory. No. 269 Leigham Court Road is an exemplar of this new wave of more humane housing for the elderly, placing no less weight on the quality of the environment which it provides, than on the practicalities of the function which it serves.